Welcome to Royal Puppy Love. Home of wonderful, sweet Miniature Schnauzer, Dachshund and Maltese puppies. I have adorable Miniature Schnauzers ranging in size from Teacup to Toy to True Miniature schnauzer size as well as beautiful and elegant Maltese baby puppies. I am located in Shawnee, Oklahoma which is about half way between Oklahoma City and Tulsa, Oklahoma. Royal Puppy Love has devoted over 15 years to producing the highest quality Toy, Teacup, and Miniature Schnauzer puppies, Doxie puppies and Toy size Maltese puppies at reasonable prices. 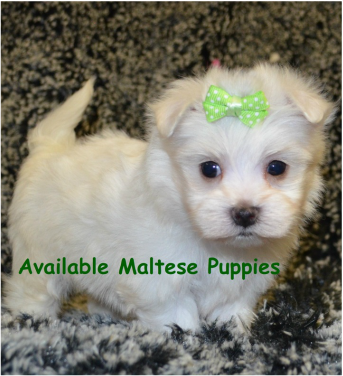 Purebred Maltese puppies come in only one color-silky, soft snow white. Toy, Teacup, and Miniature Schnauzer sized puppies come in the standard show colors of Salt and Pepper, Black, and Black and Silver. In addition, Royal Puppy Love produces the rare colored Toy, Teacup, and Miniature Schnauzers in the highly prized Liver (Chocolate), Liver Parti, Black Parti, Tri color Parti (very rare), Wheaton (a beautiful blonde/champagne colored Miniature Schnauzer), Liver and Tan Phantom and solid white. With so many choices in Miniature Schnauzers, you may end up with more than one. Royal Puppy Love puppies have it all! Great looks, good health (see our Health guarantee), fabulous conformation, and the amazing personalities for which Miniature Schnauzer, Doxie and Maltese puppies are known! These super sweet puppies will steal your heart! All litters of Royal Puppy Love Miniature Schnauzer and Maltese puppies are registered with the highly respected American Kennel Club and come micro chipped with the AKC Indigo-ISO Microchips and can be enrolled with the AKC Reunite Program so you will have peace of mind knowing your puppy is protected with the gold standard offered only by the American Kennel Club. You also have the opportunity to add the AKC Puppy Protection Package which offers the best value for your money. Lots of time, love, and attention has gone into raising healthy Toy,Teacup, Miniature Schnauzer puppies, Dachshund and Maltese puppies and making sure they receive the best start possible using the highest quality puppy food, age appropriate puppy health care, puppy shots, and puppy wormings. I take pride in the level of care your Miniature Schnauzer or Maltese puppy receives while here and I am an AKC Bred with H.E.A.R.T breeder. Your baby is my baby! If you are looking for a wonderful, healthy, playful, sweet Miniature Schnauzer in the Toy, Teacup or true Miniature Size or a Toy size Maltese puppy, you have come to the right place! We also occasionally have a few baby Doxie pups. I hope you find you new Miniature Schnauzer, Dachshund or Maltese family member here at Royal Puppy Love...where every puppy is treated like royalty! !